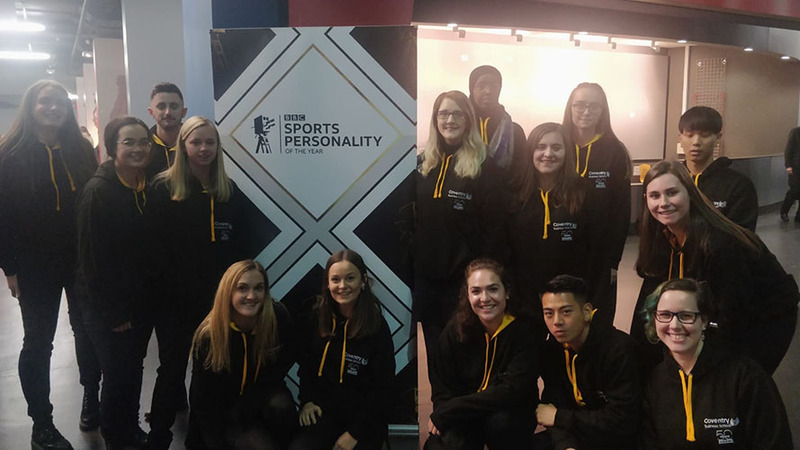 Final year Event Management students Emily Abbey and Anna Gibbs-Murray volunteered at the BBC Sports Personality of the Year 2018. Read all about their experience and find out why volunteering is vital for sport management and event management students. One of the many great things about Coventry University, and team SEM (Sport and Event Management) specifically, is the number of volunteering opportunities which are frequently presented to us. When the prospect of volunteering at the BBC Sports Personality of the Year awards in Birmingham on 16 December was offered, we knew it was an opportunity not to be missed. This prestigious event would not only look fantastic on our CVs, something we are keen to improve as we start looking to apply for graduate jobs, but it also provided us with the opportunity to gain further experience in a leadership role. Being trusted to manage the SEM volunteers on the day was daunting but a challenge both of us were keen to accept. We had a total of 30 volunteers on the day, from 10 different countries and ranging from all three undergraduate years, postgraduates and even some recent SEM alumni. The day started with a brief from the SPOTY event organisers which highlighted the key points and timings for the day and detailed our involvement. Our main role was to be on call in case of an emergency in which we would then be required to evacuate the building safely. As the two main Coventry University contacts for the day, we were given the responsibility of listening into the main radio channel for an emergency message, which we were then responsible for communicating over to the team and ensuring all volunteers were in their correct positions. Team SEM’s responsibility was then to ensure all VIPs and VVIPs were evacuated quickly and safely during the pre- and post-event hospitality at the Vox Conference Centre. Every volunteer was provided with evacuation training which included how to safely operate the EVAC chairs. These chairs were to be used for any individual who required additional assistance, such as people with a physical disability which might in some way hinder their safe evacuation through the normal routes. This training included how to appropriately communicate with these individuals and transfer them into the chair comfortably before learning how to manoeuvre chair and person safely down flights of stairs. This invaluable and industry-recognised training is now something each volunteer can put onto their CV as an additional skill, enhancing their employability. Luckily, there was no emergency or evacuation required during the 14-hour shift, but our role was arguably one of the most important for the safety of the VIPs. We were also very fortunate in getting the opportunity to watch the show live – in some of the best seats in the house – as an added bonus. Volunteering opportunities are vital for sport and event management students due to the practical natures of both degrees. It is highly important for students to gain industry experience in addition to their degree in order to stand out against other competition. Any extra-curricular experience collaborating and volunteering with organisations will attract the attention of future employers and can immediately make an individual more appealing. These experiences can then be used as the starting points to lead interview questions whilst also providing students with more examples in which to detail and further explain their skill sets. Overall, a tiring but incredibly rewarding and never-to-be-forgotten experience. ← The best and hardest three years of my life – and why I wouldn’t have changed it for the world.